This pristine, 3000 sq. ft., 2 bedroom, 2 bathroom house is the perfect place to take your next vacation. The Mediterranean home has a master bedroom with king sized bed and private bathroom, and a second bedroom with a Full and a Queen bed. The house sleeps six comfortably and features a covered porch that extends around the entire house. The front porch is home to a beautiful and large wood table (seats 10), hammocks and other comfortable seating options. It’s the perfect place to sit back and relax to enjoy the view, play games, read a book, and have big dinners. bird sanctuary with Booby nesting grounds and Tropix birds). The beach is completely private and is great for laying out, swimming and snorkeling. (seasonal) There are a few lounge chairs by the beach for optimal relaxation. The rest of the property is on 7 hectares of beautiful land, covered with native flowers and fruit trees. Beyond the beautiful view and great beach – there is much to do and see in this private location. Howler monkeys, sloths, parrots, and hummingbirds are among the animals that live and play near the house. Additionally, the surrounding area provides ample opportunity for great jungle hikes, long beach walks (where you will see starfish), kayaking, snorkeling, bird-watching and horse back riding. The best seafood restaurant on Bocas del Toro is only a 10 minute drive away – or if you are feeling adventurous – a 40+ minute walk away. It the perfect spot for those looking for rest and relaxation, nature and solitude, and/or a private vacation with family and/or friends. Because it is about 45 minutes away from Bocas town – this home is probably not the best vacation spot for those looking to be entertained by the Bocas nightlife.Taxi service to the house is $30. Additionally, the house is entirely “green.” It uses sun and rain for energy and water and we may only ask you to use electricity responsibly. (1) The owner and two friendly dogs live on the premises, in the Studio apartment above the house ( separate units, same house) The dogs do like to visit with our guests. We are here to assist you. Keywords: Slightly remote, very private, great beaches. This 15 hectare estate with 700 feet of ocean front beach and an expansive tropical garden with rolling lawns was quite a fine. The owners Gundula and David who live on the upper level of the house were warm, helpful and outgoing. 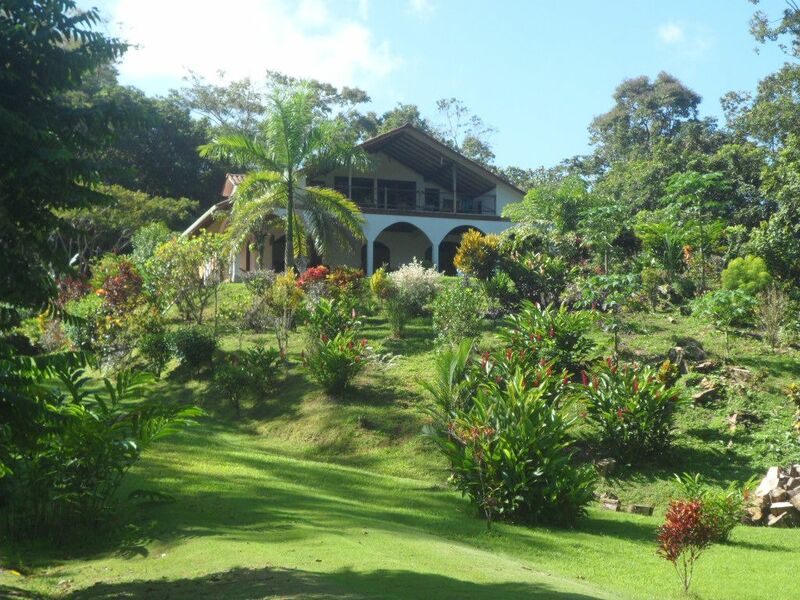 The ground floor of the house is the rental and offers a very large 2 bedroom, 2 bath living space with a large open living room/dining room and large stone patio overlooking the garden, ocean and bird island which lies about a mile offshore. We were lucky to have a calm ocean when we were there and swam in the ocean everyday. David picked us up from town with his 4x4 truck and took us shopping to the local fish store, vegetable stand and grocery store in town and then out to the house which was a 30-40min drive. He also drove us back to town when it was time to leave. I stayed at the house with 4 friends and would happily return with my family. The house was well maintained, clean and the kitchen well appointed with all necessary appliances. Casa Mañana is better than advertised. That is not to say the listing is not good. In fact, that is why we booked the place. However, once you get there you will see that the property is well taken care of. There are flowers and fruit trees all over the place. The grass is well “manicured” and the beach on the property is clean! We walked along the beach front to the neighboring beaches and none of them were as well taken care of as Casa Mañana’s. We go to see and hear Howler Monkeys on the treetops of the property. There are all kinds of birds as well. But the best part of staying there is hospitality Gundula and her husband offer. They are friendly and helpful and far more for us than we expected. We would certainly go back to Casa Mañana. Is certainly recommend this paradise to anyone! We loved having you with us. Everything described is "as-advertised" but the pictures just don't do it justice. Amazing property, like being on your very own resort. The beach....well, just amazing. The flora and fauna are amazing, better than most botanical gardens. Saw a sloth from the porch and howler monkeys at the end of the driveway. Walking down the road, we saw plenty more. Gundula is a fabulous hostess, showing us around the property and answering all of our questions, setting up excursions, sharing her treats and has wonderful knowledge of the area. There was a new puppy, which was adorable and the large dog is very well mannered and we were happy to have them around. If you like private beaches, beautiful views, relaxing walks and nature, well....it's all here. I would not only recommend it, but I will return!! Thanks, Gundula!! Great beach! Gundula’s service is top notch and her property is the best. We will be coming back soon and stay here the whole time. Great way to get away from the city life and enjoy peace. We enjoyed a memorable week in early April at Casa Manana. The property and beaches are even more beautiful than we imagined. Gundula was an amazing host helping us arrange a boat tour of the islands, getting us to town and providing fruit from the property which we prepared and and ate, including coconut, plantain, limes and yucca. The beaches are just amazing, we walked and explored for miles and hardly came across other people. We kayaked out to bird island and snorkeled on our boat tour out to Zapatillas Island. Being in the jungle along beautiful Caribbean beach was amazing. The home is well equipped. We cooked most of our meals here and ate a the large table on the covered porch. The home is open air allowing the breezes and tropical air to keep comfortable. We were never too hot or too cold. There is not much development nearby, stores are in Bocas Town 45 minutes away, but there are a couple nice beach front restaurants in Boca del Drago, about 15 minutes away. If you are looking for a place to relax and explore the beauty of the jungle and beaches, I definitely would recommend Casa Manana. It was the perfect getaway. It is secluded beautiful and so relaxing. We would go again. We drove our car our so we were able to explore the island. The beaches are awesome. We took a boat ride one day and went to the bat cave ( very neat, recommend water shoes) snorkeling and a beautiful day on the water. The hostess is awesome. She gave us lots of food that grows on the property, always helpful and just a joy to talk to. The house was well stocked with kitchen set up and clean linens. If I could give more than 5 stars I would!